Hey all! 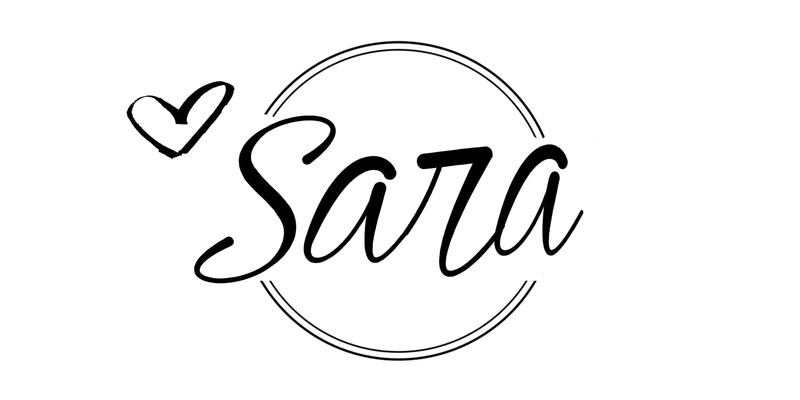 It’s me, Sara from Twelve On Main! 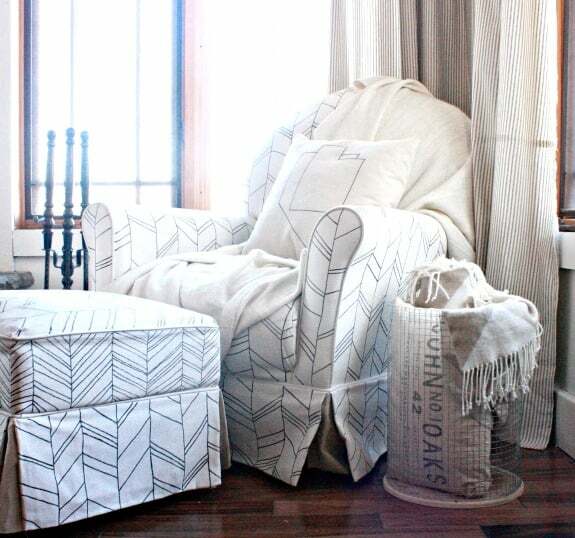 I am excited to be back again today with a DIY wire basket tutorial. 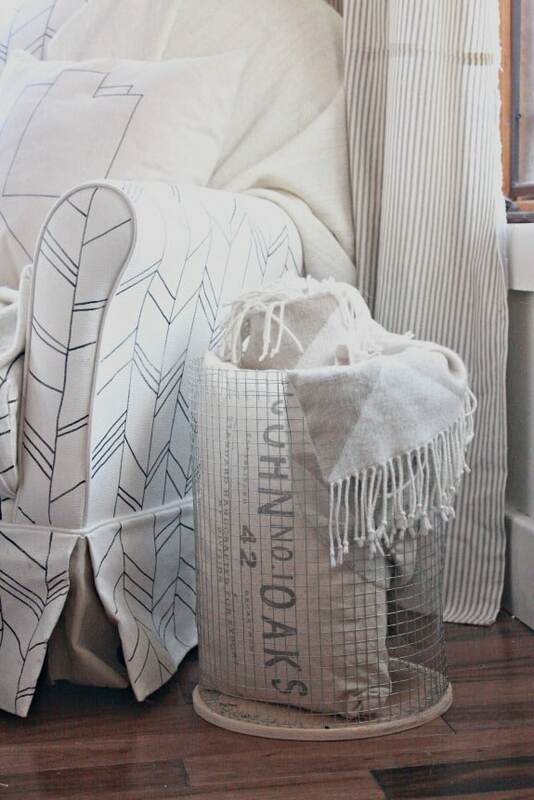 Honestly, I have been wanting to figure out how to do a DIY wire basket for quite a while. So, that is just what I did. The first thing I did was figure out what I needed for this project. 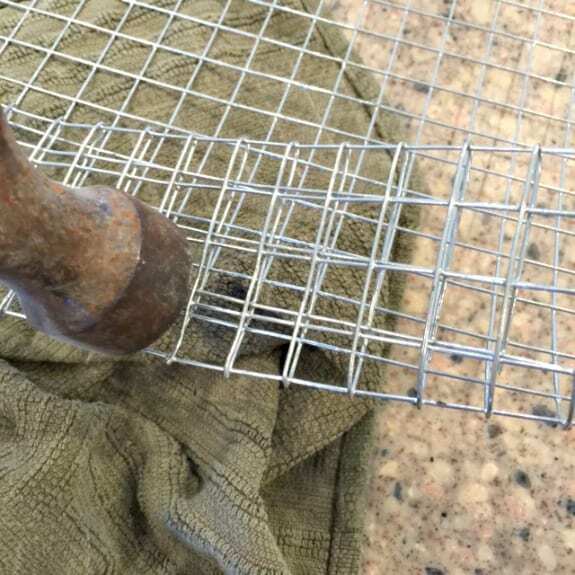 I used a 19 gauge wire mesh to make the basket. 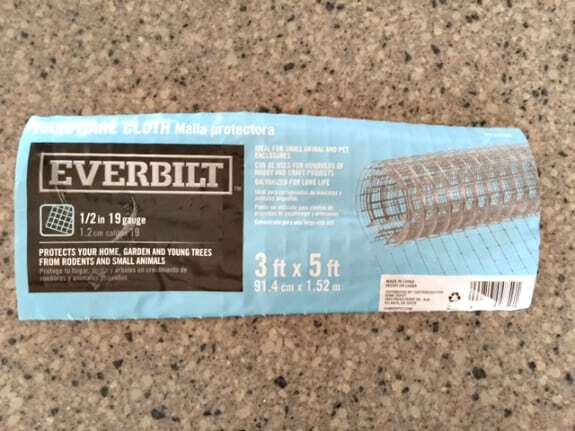 There are many different types of wire mesh to choose from, but I decided to buy a lighter gauge to make sure it was easily manageable. I also bought a smaller roll 3ft by 5ft. I think I will go back and purchase some more now that I feel more confident in my basket making abilities. 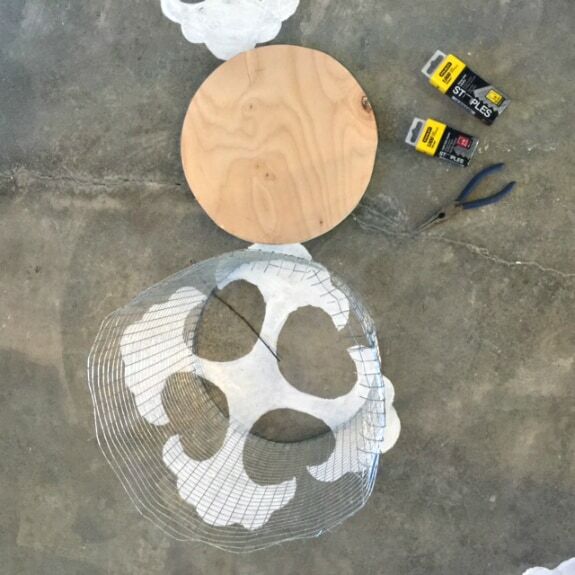 So, I started by figuring out what shape and size I wanted to make my basket. I decided I wanted to go a little outside the box and create a rounded basket with a wooden bottom. 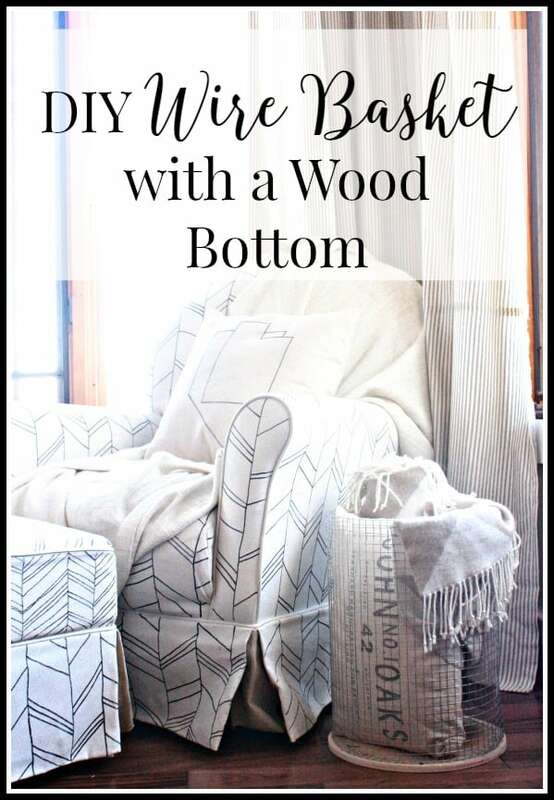 The great thing about this shape is that it could have so many uses, from a firewood holder, to a safe haven for blankets and other trinkets, and even can be used as a very stylish trash can since it is a little more sturdy with the solid bottom. The reason I decided on the solid bottom was to give it a more sturdy feel. 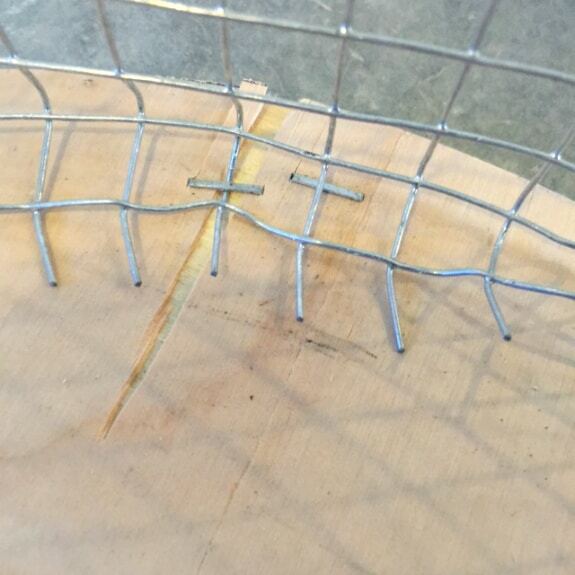 Since I decided on a round shaped basket, I unrolled the wire mesh…this takes a little bit of muscle and finesse. I used my wire cutters to cut the wire the full length of the panel. 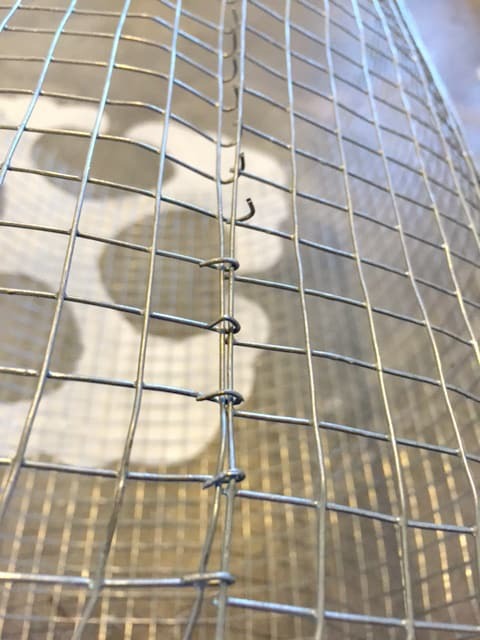 I used a pair of needle nose wire cutters to cut the wire. 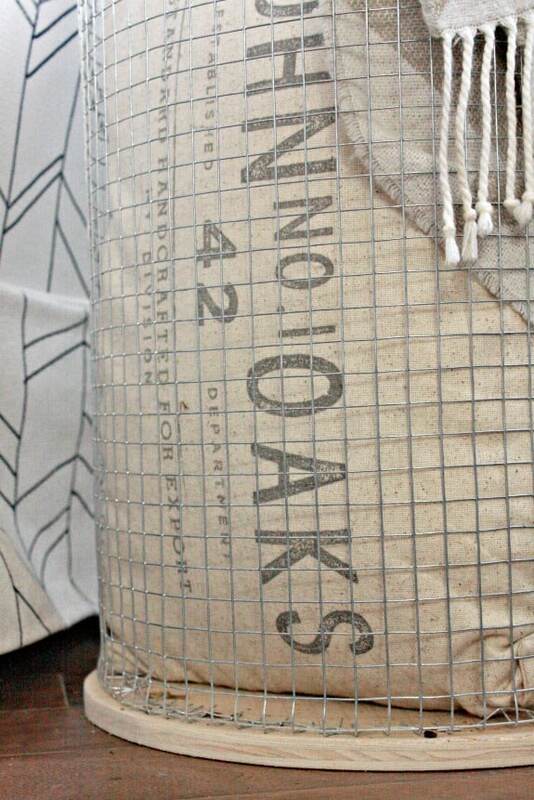 These will be a very important instrument in your basket making. You will see in a minute what I am referring to. 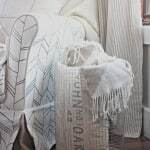 Once I have cut the piece out that I need, I found the top of my basket, and folded it over to create a sort of “hem” like you would on fabric. 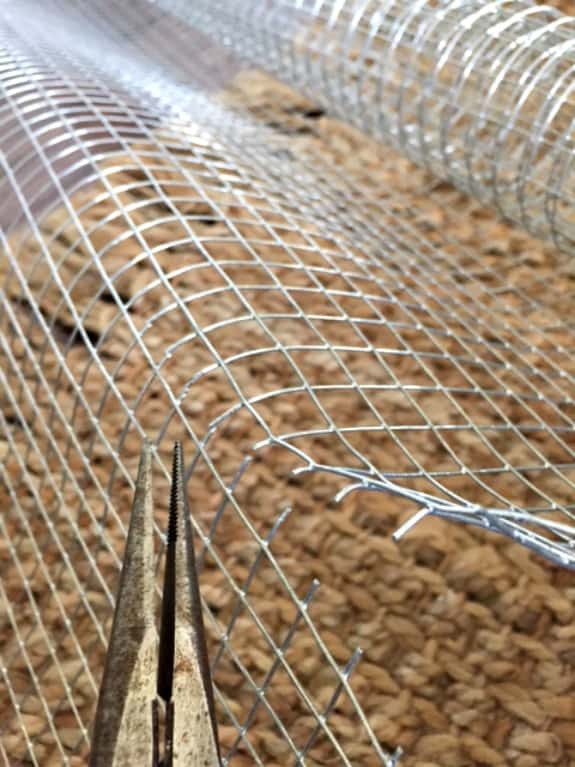 The main reason I do this is to create a barrier from the sharp edges of the cut wire. You can fold it over one, but I folded it once more, just to add a little more security. I used a hammer and a towel to make sure I got a secure and straight line. 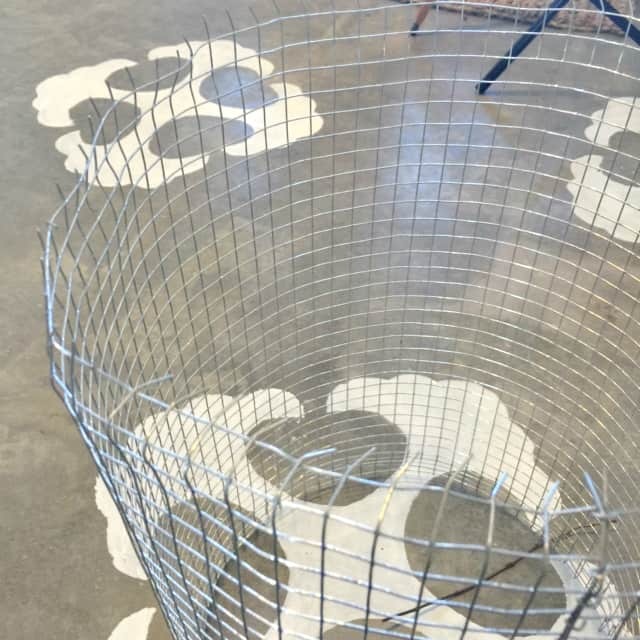 You can see where the basket will be connected in the picture above. 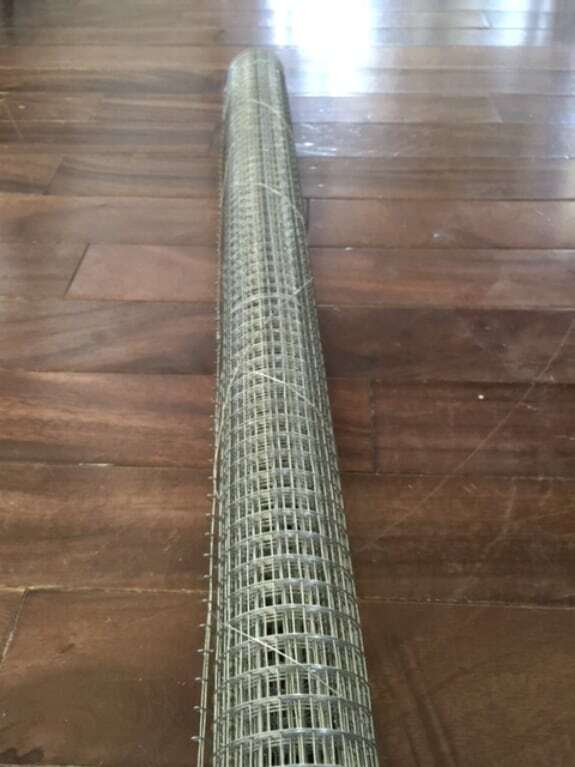 You want one side to have longer wires and the other side to dead end. You want to take those needle nose wire cutters and twisall the long wire pieces into a “U” shape. 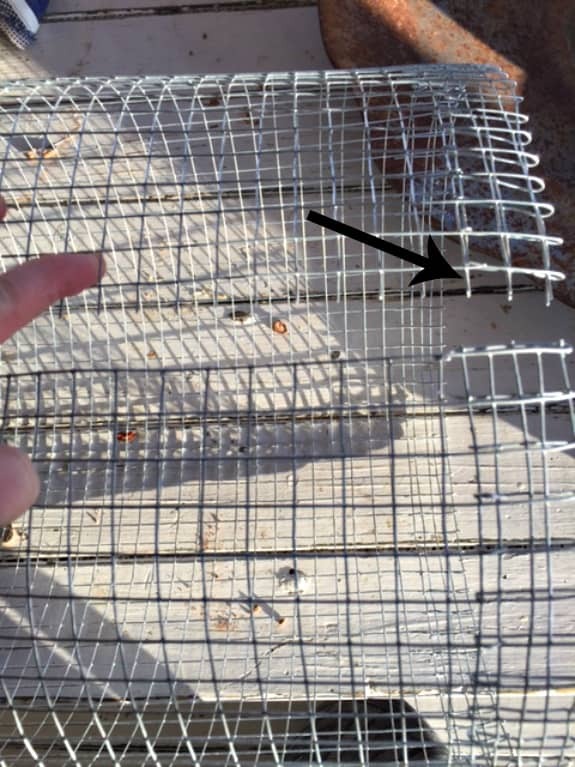 You are then going to connect the “U” shaped part with the dead end on the other side of the wire sheet. You will need to hook the “U”s through the other side. You can then start clamping down each “U” shape. This is going to secure the basket. I have created my cylinder. Now it is time to cut a round out of wood for the bottom. I purposely made my basket the same dimensions as a plastic 5 gallon bucket. This way I had a template to cute my round from. I cut my wood with a jig saw and then used a piece of sandpaper to smooth the edges. 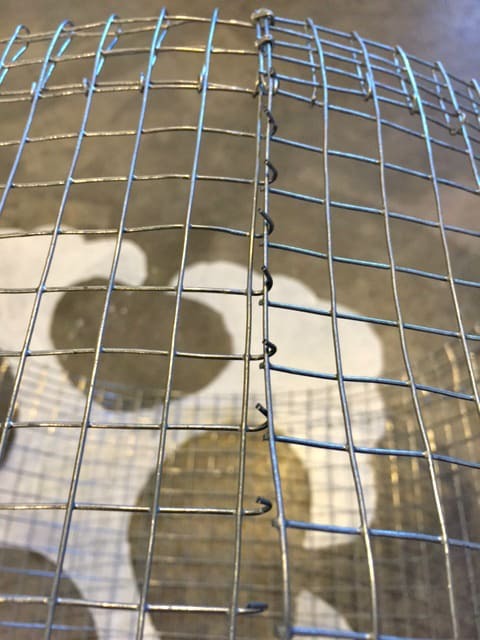 The next step is to the bottom row of wire mesh and fold it in towards the center of the basket. this is what you will use to attach to the wood base. I used my needle nose wire cutters for this too. Once you have gone all the way around the basket folding it down, I set it on top of my wood round. I used my electric stapler to begin stapling the wire to the wood. I first stapled in 4 places. Think of a clock. I stapled at 12, 3, 6, and 9. I made sure that each side was the same distance form the end of the wood round and that it was staying round. I then continued stapling adding one to each segment making sure it was rounding nicely. Sometimes I needed to push out slightly to keep it even and sometimes I needed to pull it in a bit. 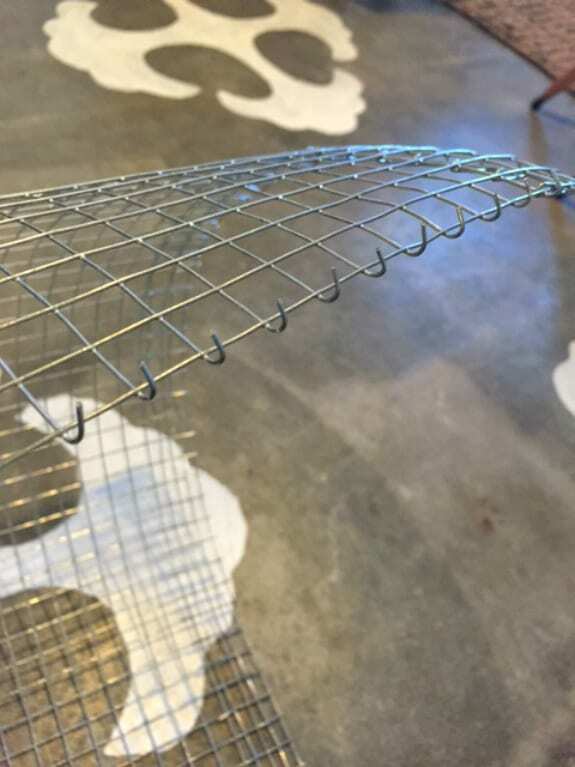 This wire mesh was quite easy to maneuver and there is a lot of room for error. Once I was done stapling, I checked to make sure the top was still nicely rounded and that all the sides were smooth and together. 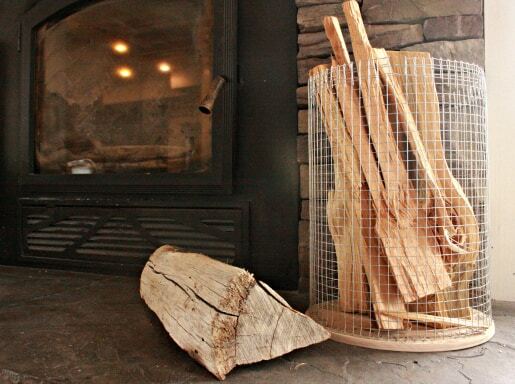 I initially liked the idea of using it to hold the kindling and firewood for my fireplace. But, then as all things in my home, it found another purpose. Boy, do I love it here. 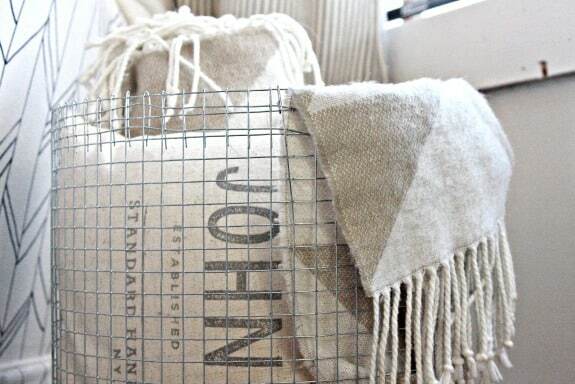 The industrial look combined with the softness and textures of the blanket and pillow help create a cozy little reading nook in my family room. and on and on….. the possibilities are endless. 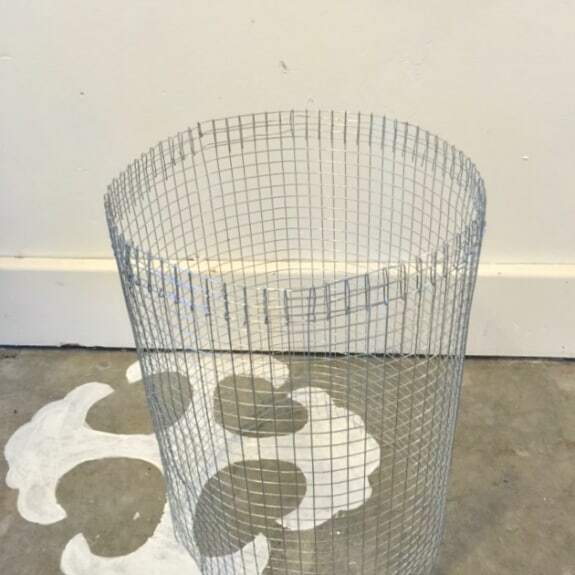 Thanks for taking some time out today to check out this fun DIY wire basket tutorial. I hope you will give it a try.